We are delighted to announce the latest title in the Airframe Album series. This series offers everything that modern modellers want when they are tackling a specific subject. Our fifteenth title in the Airframe Album series is an essential companion for anyone tackling the HK Model (1/32nd), Tamiya, new tool Airfix (1/48th), Dragon, Special Hobby and older kits in 1/72nd scale. detail images of preserved examples; 3D isometric views of prototype and production machines by Wojciech Sankowski; colour profiles by Richard J. Caruana; 192 pages; lists of accessories and decals; kit builds of the new tool Airfix 1/48th FR Mk 9 by Steve Evans and the Dragon 1/72nd F Mk I by Libor Jekl. Special Pre-order Offer - save money! Save on postage; pre-order before April 23rd and save £2.00 on post and packing, both UK and worldwide! Save on cover price; pre-order before April 23rd and save £1.00 on RRP! The updated and expanded edition of our fourth title in the ever-popular Airframe & Miniature series, The Hawker Tempest. This fourth book, back by popular demand after a long absence, now contains over 160 pages packed with vital information that no active modeller and Tempest enthusiast should be without. 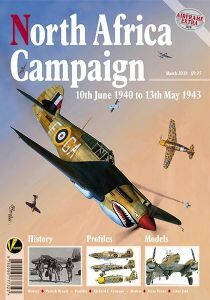 New content includes builds of the new tool 1/48th Eduard Tempest V by Steve A. Evans and 1/32nd Special Hobby Tempest V by John Wilkes, new stencil diagram by Richard J. Caruana & new front cover by Jerry Boucher. Original content includes technical information, walkaround images and diagrams, camouflage and marking notes & profiles, model builds and modelling information, over 200 photographs including wartime images, colour side views Richard J. Caruana, 3D isometric views of all variants by Jacek Jackiewicz, 1/72nd, 1/48th and 1/32nd scale kit builds by Libor Jekl, Steve A. Evans and John Wilkes, and a full set of fold-out 1/48th scale plans. We are delighted to announce the next title in the Airframe Detail series. This series of books offers everything that modern modellers want when tackling a specific subject. This title includes historical photographs and technical diagrams; period detail images during production and service use; data from flight manuals and spare parts catalogues; colour profiles by Richard J. Caruana and concise camouflage and marking notes; lists of all Ta 154 kits, accessories and decals; kit build of the 1/32nd Ta 154 from HpH Models by Steve Evans. 64 pages plus covers. Our fourteenth title in the Airframe Album series is an essential companion for anyone tackling the Revell (1/32nd), Tamiya, new tool Revell (1/48th), Hasegawa, new tool Airfix and older kits in 1/72nd scale. detail images of preserved examples; 3D isometric views of prototype and production machines by Chris Sandham-Bailey; colour profiles by Richard J. Caruana; lists of accessories and decals; kit builds of the new tool Revell 1/48th Beaufighter TF.X by Steve Evans and the new tool Airfix 1/72 TF.X by Libor Jekl; 176 pages. A Limited Edition reprint is available of Airframe Constructor No.2: Building the Heinkel He 219 Uhu – A Detailed Guide to to building the Zoukei-Mura 1/32nd kit. This title includes a wealth of historical photographs and detail images of the world’s only complete preserved Defiant; period detail images during production and service use; data from flight manuals and spare parts catalogues; colour profiles by Richard J. Caruana and concise camouflage and marking notes; lists of all Defiant kits, accessories and decals; kit build of the new-tooled 1/48th Defiant from Airfix by Steve A. Evans. Also includes 1/48th scale plans! Valiant Wings Publishing’s twelfth title in the well-established Airframe & Miniature series is The Supermarine Spitfire: Part 1 - A Complete Guide To The Famous Fighter by Richard A. Franks. This twelfth book in our much-acclaimed series will contain 240 pages packed with vital information that no active modeller and Spitfire enthusiast should be without. Contents include technical information; walk-around images and diagrams; camouflage and markings; model builds; colour side views by Richard J. Caruana; 3D isometrics by Wojciech Sankowski; and kit builds by Libor Jekl, Steve A. Evans and Dani Zamarbide. Many active scale modellers like to build subjects based on a theme or historical event. This series looks at specific areas and events in the history of aerial warfare. Covers the historical aspects of the battles on the ground and in the air in North Africa from Italy's declaration of war on France and the United Kingdom on the 10th June 1940 through to the surrender of all Axis forces in Tunisia on the 13th May 1943. The historical narrative is by Patrick Branly with numerous period images; colour profiles by Richard J Caruana. 1/32nd Hawker Hurricane Mk IId by Steve Evans. The first eight Airframe Extras, 1: ‘D-Day To VE Day’, 2: 'The Korean War', 3:'Battle of Britain', 4: 'Battle of Taranto', 5: 'The Spanish Civil War', 6: 'Continuation War', 7: 'The Suez Crisis' and 8: 'Air War Over Italy' are also available. Klarna Checkout is a complete integrated payment solution, and a simple alternative if you don’t want to use or are unable to use Paypal. You can use Visa, Mastercard or direct bank transfer. There’s no registration needed and no login or passwords. Klarna works with mobile devices and there is a 14 day deferred payment option. Please note that we have now removed telephone payment from the list of options but if you prefer to pay by card over the ‘phone, just call us on +44 (0) 1234 273434. - to make use of these services just select the required option during checkout. We stock Gunze-Sangyo Aqueous Hobby Color paints and materials for sale at shows. (We are currently unable to send these through the post.) The show listing (left) details our next show/s - hope to see you there!